When it comes to Halloween, if you aren’t over-the-top, you’re not doing it right. 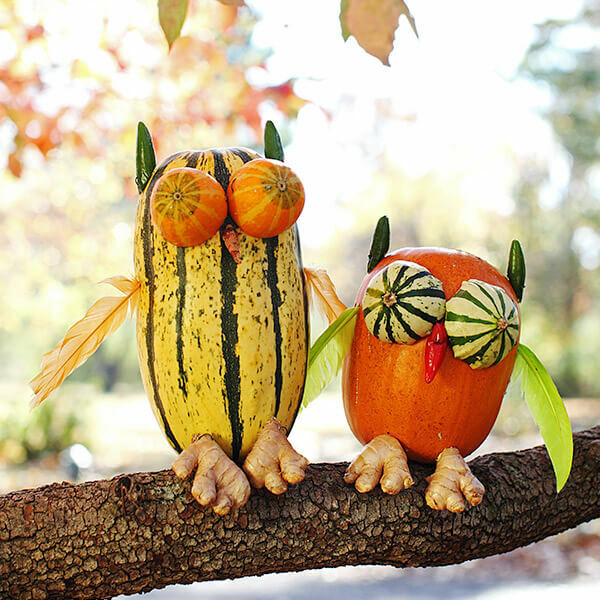 Take a journey with us through an enchanted forest where the pumpkins are creative yet frightfully easy to make. Follow our simple instructions to create the perfect jack-o’-lantern from our top 10 pumpkin-carving ideas. To make most of our jack-o’-lanterns, all you need are the basic art skills (like gluing and tracing circles and squares) that you mastered as a kid. 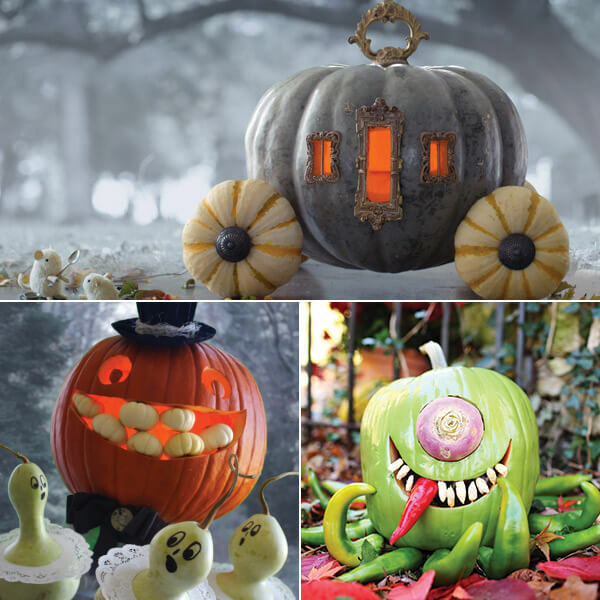 An electric pumpkin carver makes them scary-easy to create, but don’t fear—any of these pumpkin-carving ideas can be done with the tools you already have at home. Set the altar for shivery fun with this gruesome twosome who are ready for their Halloween wedding day. 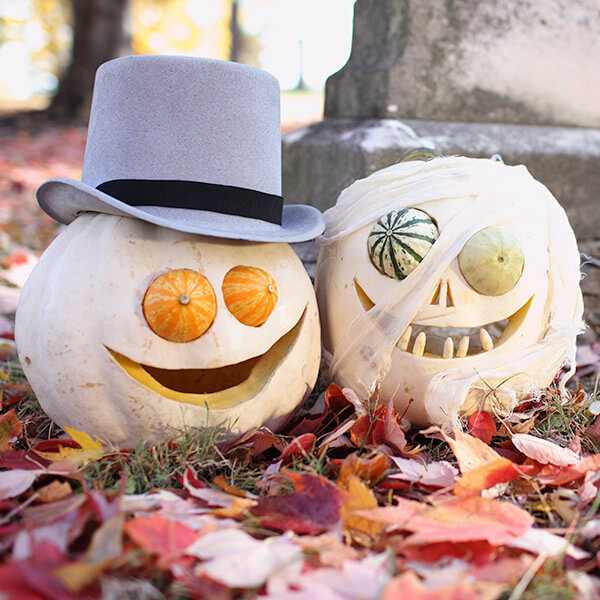 With a snazzy top hat for the groom and some gauzy wrapping for the bridal veil, you’ll be on your way to creating your own mummy pumpkin man and wife—until death, or rot, they do part. 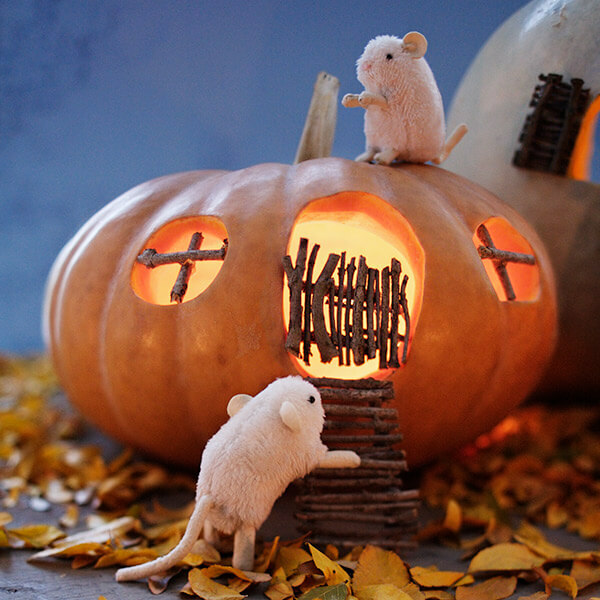 To build these mini mice mansions, gather a few oddly shaped pumpkins, a carving tool, twigs, dried leaves, a hot glue gun or craft glue, and a few faux mice (shiver). To make the houses, cut holes in the pumpkins for the door and windows. Then break your twigs until they’re all similar in length, proportional to the holes. Glue twigs together to make the window frames, shutters, doors and ramps. To attach the twig accessories, insert the twig ends into the pumpkins and glue to secure. Scatter dried leaves around the base of each pumpkin house. Add your friendly woodland creatures to complete the scene. Macbeth’s witches have nothing on these ladies. 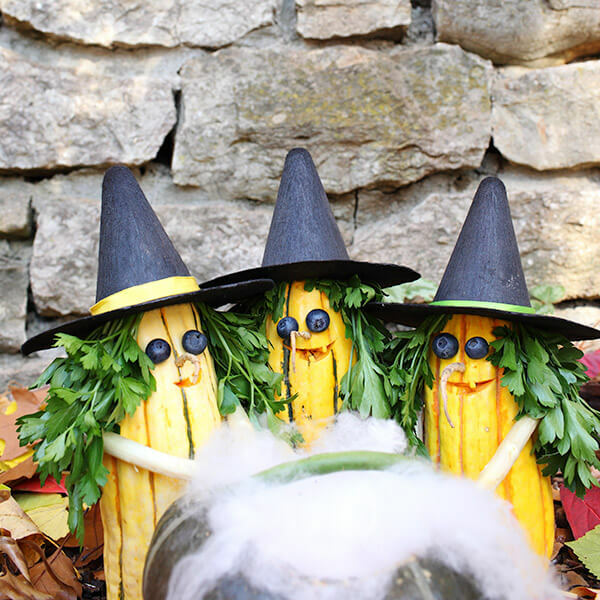 But don’t worry, not much toil or trouble is needed to turn these girly gourds into midnight hags. Reenact their boiling cauldron scene with a few wickedly fun ingredients—eye of newt, alas, is not included. 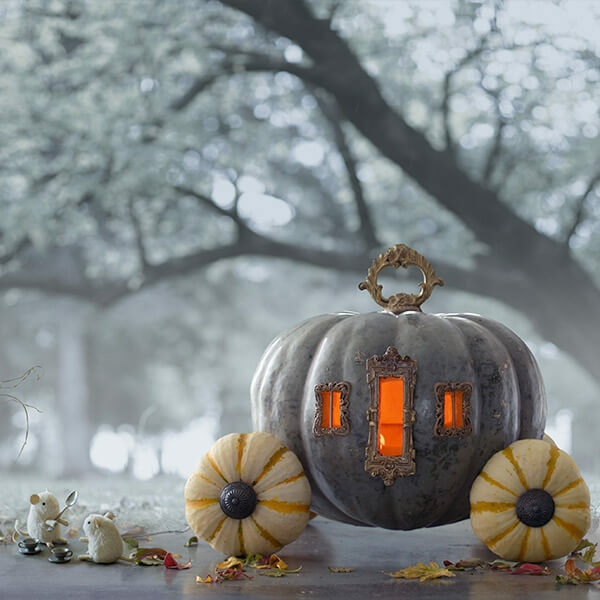 The subtle blue-gray of this pumpkin lends an air of mystery to this charmed carriage. Fancy belt and jewelry findings and a few pieces of hardware come together to create a magical midnight ride. A parliament of screech owls will liven up your night of fright and keep watch over the trick-or-treaters in your neighborhood. We’ll show you how to create these creatures on the fly with just a few simple materials. This adorably ugly couple has found true Halloween love. To duplicate this duo of doom, first you’ll need to peruse your pumpkin patch for a long, curvy-stemmed pumpkin or gourd and a warty-fleshed pumpkin (such as the knucklehead variety). To make Reek, hollow out the warty pumpkin and carve him a grin. 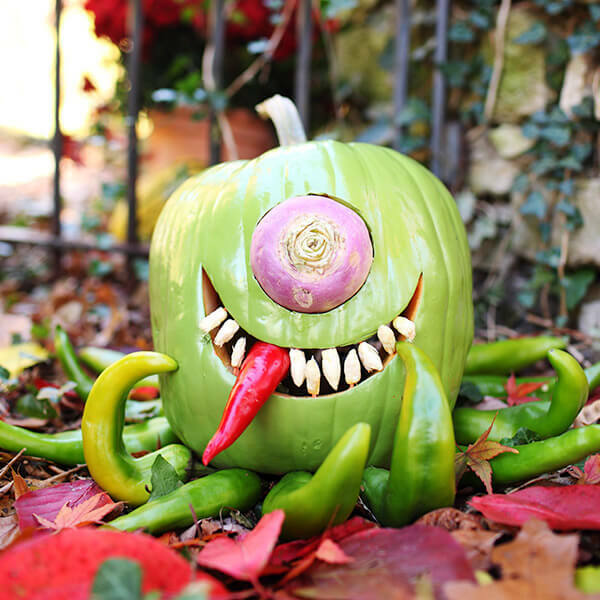 Attach mini pumpkins, cut in half, for his eyes. For his teeth and antenna, look around your house for odds and ends—especially your refrigerator. For example, we used pieces of white asparagus to make our Reek’s teeth. Attach what you find with florist wire or glue. To make Shriek, first roll a long-stemmed pumpkin or gourd on its side until the stem “nose” is the perfect angle. Lop off a piece of the new “bottom” with your carving knife so the pumpkin won’t roll back. Next, carve a shallow little smirk under her nose. 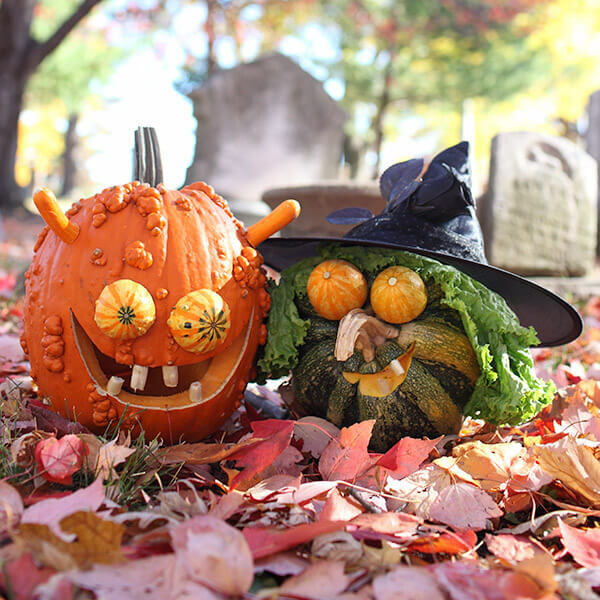 Then grab a costume witch’s hat, some leafy lettuce from your fridge and 2 mini pumpkins for her hat, hair and eyes. Attach them with toothpicks or florist wire. 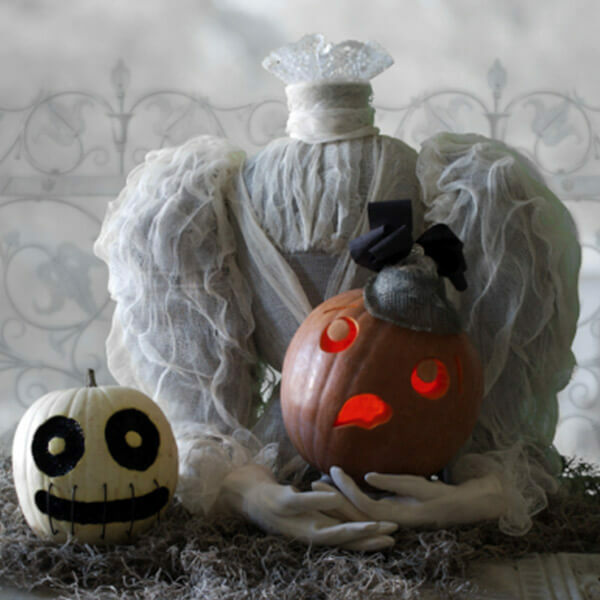 We went all out to create Madame’s body, but this scene is equally spooky, and much easier to duplicate, if you just make hands to hold a surprised pumpkin head. We’ll show you how to do both. 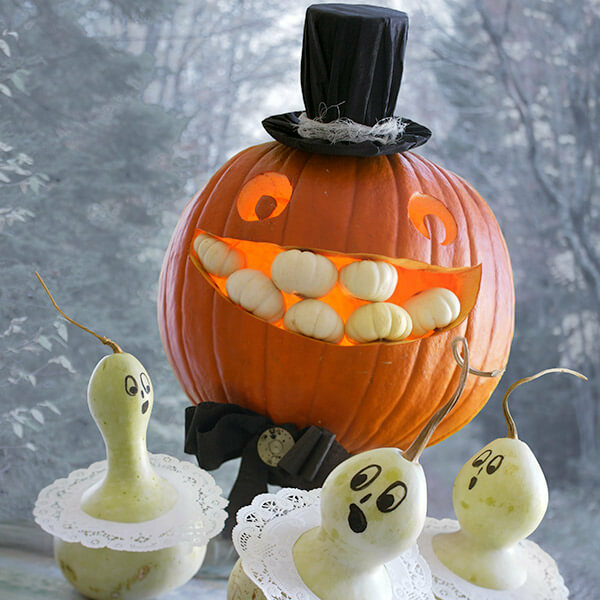 To create this scene in which the lady gourds are looking up in fright, place this ghoulishly grinning pumpkin on a cake stand or a small stack of books. Or, if you want to take a friendlier approach, you can turn Mr. Pumpkin into a lounge singer with the damsel trio singing backup. 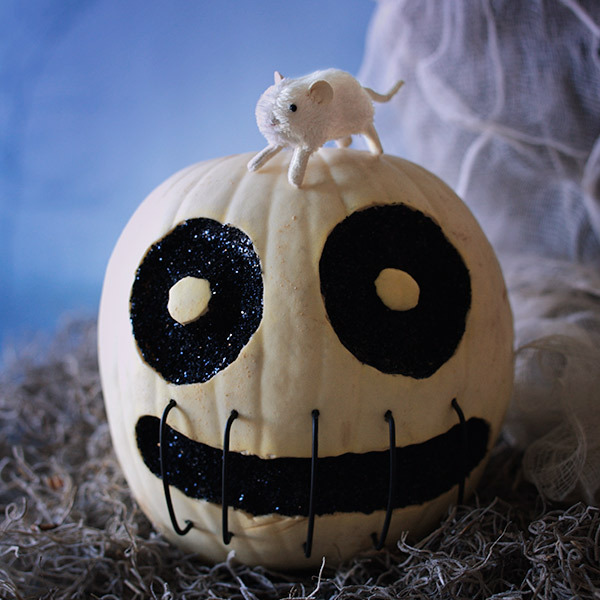 Sew up this skeleton’s smile with some heavy-gauge black florist wire. But allow a few days between all the steps so he can thoroughly dry out. To make Skully, start with a white pumpkin, a melon baller, craft glue, black glitter, heavy-gauge black florist’s wire and wire snippers. Scoop out shallow circles with the melon baller for his eyes and a curved line for his smile. Let him dry overnight. Turn him so his face is facing up, then fill in the carved areas with a coat of craft glue and cover the glue completely with the black glitter. Let him dry again. Finally, insert 5 curved pieces of florist wire above and below his mouth to form his seemly, or rather seamly, stitches. Additional contributions from Hallmark photo stylist Joe Blake. Hallmark photo stylist, Betsy Gantt, has created countless sets and all manner of handcrafted props, including cradles for kitties, elaborate fairy scenes and tiny trinket worlds. She spends her free time exploring flea markets for tiki collectibles and perfecting the mai tai.